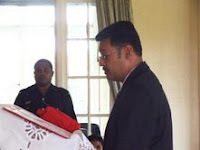 Chaitanya Lakshman, who was today sworn in as one of the three magistrates and two judges under the New Legal Order, was one of the nine Fiji Labour Party MPs appointed as Cabinet Ministers in the SDL Labour Multi-Party Cabinet, headed by the former prime minister, Laisenia Qarase. It's understood Lakshman worked for the University of the South Pacific law faculty and was employed as the legal officer in the Complaints Division of Fiji Human Rights Commission before he contested the 2006 elections for the Labour Party. He won the Viti Levu South-Kadavu Indian seat – one of the 31 seats won by FLP. Lakshman was appointed as the Minister for Local Government and Urban Development. Sources say following the Frank Bainimarama coup, Lakshman also acted as the secretary of the Fiji Bus Operators Association and devoted his time to completing his luxurious home alongside the Queens Highway in Navua. Sources say Lakshman was practicing as a lawyer from his home but was struggling for business. Lakshman comes from a family of solid financial background. His late father and his paternal uncles all carried the title "Prince" before their given name. His uncle Prince Gopal Lakshman was a FLP member of Parliament from May 1999 to May 2000 and September 2001 to March 2006. Another dog who will face the full brunt of the law.